Sound good? Ok, now if only T-Mobile can keep those slippery HTC HD2’s in stock! The first bullet point says “grandfathered” family plan customers are covered, but that “some plans and programs are ineligible.” Any idea of which family plans/programs are grandfathered and which are on the ineligible list? I think this is exactly what i was waiting for no need to go to store to get the deal. no need to call any stores. is this bogo good for upgrades in stores as well? @TMOTECH: My order shipped yesterday, so apparently we got a large shipment from htc. I also ordered mine half an hour before they were supposed to go on sale, so I suppose it depends how far back in line you are to get yours. Good luck! 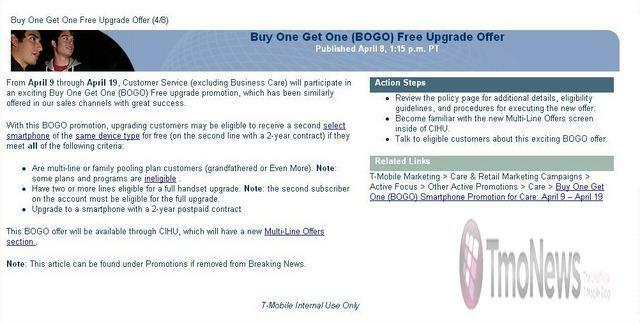 I sure do wish the Bogo applied to the people that are Full Discount Qualified but bought the HD2 outright. I bought my hd2 outright so I wouldn’t be under contract but oh well. I don’t need 2 HD2’s anyway. @Carl…no, employees cannot use the BOGO offer to pick up new phones. moose just tried that and customer care said their systems are down what did you say to get them to honor it I am on the same boat and the store reps are sold out for a while. i called coustomer loyalty and they did all the work i just told them what i wanted. After a month of trying to get a BOGO deal on an HD2 and a Fender MyTouch, and being told by the store and customer care that it would happen, and then when the phones were in stock being told they couldn’t do it for an upgrade I’m going to ATT for 2 iPhones. It was a good 6 year run with tmobile but their lack of concern for a longtime customer just pissed me off. Good luck to all.